If you need help designing your flyers, leaflets, brochures, stationery or business cards - no matter how simple or intricate, we have our own in house design studio on hand to create you a professional and effective eye catching design that will bring your ideas to life with creativity and zest really making your business or event stand out from the crowd. Just have a browse through our portfolio at the bottom of this page (these are a small selection of previous designs that we have created that have worked wonders for each of the clients). (1) Yes- I will upload my files.. 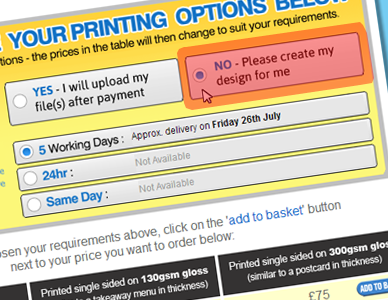 This option is only for print where we basically print directly from your file - which you upload to us after payment. (2) No - Please create my design for me.. This option includes full design and print. If you need only slight amendments to your file we can usually do this for you without paying for full design - just drop your file on an email and let us know what needs changing and we can quote this for you (prices start from £10 for changes to your existing files). The design really is the most important aspect of your print - there is no point in printing thousands of flyers if they are just going to end up in the recipients bin is there? We always recommend you spend a good amount of time on your design and put plenty of thought into it. If you decide to let our professional designers take care of this we will work 'from scratch' with your design - we don't use templates (like some of our competitors) so you won't end up seeing someone else with the same design further down the road! We can work with images supplied by yourself or we can source professionally taken photos at a small charge from one of the royalty free libraries we subscribe to which have millions of images pretty much suiting any project (take a look for yourself @ www.istockphotos.com). We keep the process as simple as possible - once you have placed and paid for your order online, you will be directed to our 'Design Brief' webpage - asking you for a 'design brief'. Imagine sitting next to a designer and telling them what you are looking for (e.g. "put my logo at the top in green, put a picture of a horse in the middle with a special offer slash in the corner and put my phone number at the bottom.." - you get the idea). Just drop all your ideas and any images you wantin this form and click 'SEND' (we do this rather than over the phone so our designers have a hard copy to work to). Don't worry about heirs or graces just tell us in simple terms what you are looking for. they'll come up with a professional design you can be proud of. 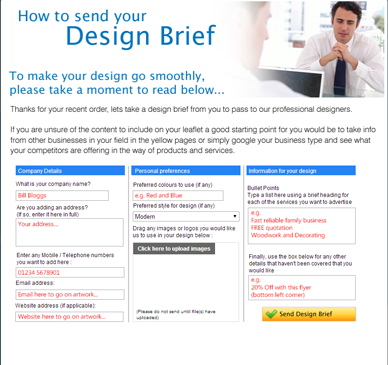 Once we receive your design brief our designers will get started on the magic! Your initial proof will be emailed to you within 3 - 4 working days as a .PDF - if you need to make any amendments to this proof, no problem - just drop the amendments on an email and we'll get a revised proof over to you within 2 - 3 working days. The design inclusive price we charge includes one set of authors amendments so please be sure that you include all your amendments when you send them to us - If you do miss anything in your first set of amendments don't worry, we can make further amends at £30 per set. Once you are happy for us to go to print, drop us an email approving the design and we will get cracking with your print, your order will then be despatched within the turnaround you originally requested.